SIGN UP TO GET MY FREE TIPS & VIDEOS, SO YOU CAN BEAT OVERWHELM, GET FOCUS & MOVE ON. STOP PROCRASTINATING! Aspiring Career Changer Or Entrepreneur? Done with overthinking, analysis paralysis and overwhelm? Ready to get professional advice on which of your (many?) ideas to focus on and get a gameplan together to make it happen? I can help. 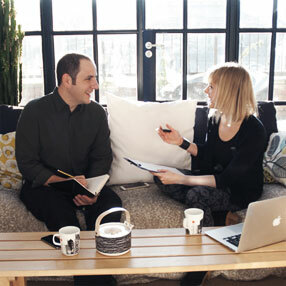 Work 1:1 with Rikke for a 100% tailored, personalised and solution-oriented approach. Wondering if you are in the right business? Or if you need to do something (completely) different? Want help choosing and (re)designing the ideal business concept for you at this stage in your life? Let’s make sure your business brings out the best in you AND makes sense to your clients. Work 1:1 with Rikke to nail down your next/revamped business. Don't know what kind of change you want? Get the step-by-step online programme AND live access to Rikke via Group Q&A calls. “I would recommend anyone who is considering branching out on their own, or who has a spark of a new business idea they believe in, to invest in working with Rikke to help them fine tune their vision and kickstart their start-up journey. Rikke can help you both on a practical level (building action plans and keeping momentum) and on an emotional level (overcoming limiting beliefs like imposter syndrome – a big one for me! – and helping keep you upbeat and positive), thanks to her many years working with entrepreneurs and career changers just like you. “I had been in the same industry for 18 years, the same company for 13. I had become bored and disillusioned with investment banking, and craved a new challenge and to start something for myself. I just didn’t know what my ‘thing’ was. After spending just 1 day with Rikke, I was transformed from someone who only knew what they didn’t want to do with their career into someone who knew exactly where I was going. Most importantly I had a great idea as to how I was going to get there, and a timeline from road testing (without handing in my notice) through to starting my new sports events business on a full time basis. “Before I worked with Rikke, I was one of those people who seemed almost like a modern cliche. I was ‘successful’ in my entrepreneurial career as a speaker and consultant and had a waiting list of clients hoping to work with me. Still though, something was missing. I was no longer engaged in my business (ironic, given that I had complete control over it).